One of the final works of tsarist Russia’s golden boy Marius Petipa, Harlequinade is dance without a dark side – no lovers dying bestride a tomb, no curses from centuries past, no personalities split into white for good and black for evil. Indeed, it’s intriguing to ponder how many things that were feared within a few years of 1900 don’t come even near the stage at the Kennedy Center – the bloody end of imperial Russia as Petipa knew and enjoyed it, the collapse of blood-related royalties across Europe with World War I, the darkening and deepening psychological understanding of humankind itself. No, none of that, despite bits of unintended foreshadowing from Petipa’s earlier and greater works of choreography – especially Swan Lake but also Don Quixote, The Sleeping Beauty and La Bayadere. Great entertainments all, as full-evening ballets are forced to be, no matter what their source. But in Harlequinade, after three decades of ruling the dance scene around St. Petersburg, Petipa takes up with a lowbrow Italian comic tradition that contributed to everything that would ever make us laugh again. American Ballet Theatre, since its founding in New York on the eve of World War II, has shown a genius for underlining the third word in its name. We should be grateful the company commissioned artist-in-residence Alexei Ratmansky to dig back across more than a century to unearth Petipa’s very limited notations and find a way to present the master’s homage to Italian commedia dell’arte in an authentic way that still manages to surprise and delight. While much attention gets paid to the archetypical characters of this simple, ancient form of public entertainment, commedia also hints at its importance by using a kind of clicking magic wand called a “slap stick.” Every “slapstick comedy” owes the style a nod of thanks. And since it was created in Italy for city and country audiences without a lot of written or even spoken mastery, commedia’s love of cheap sight gags and other now-iconic gestures seems to inspire every mime on every street corner around the world. 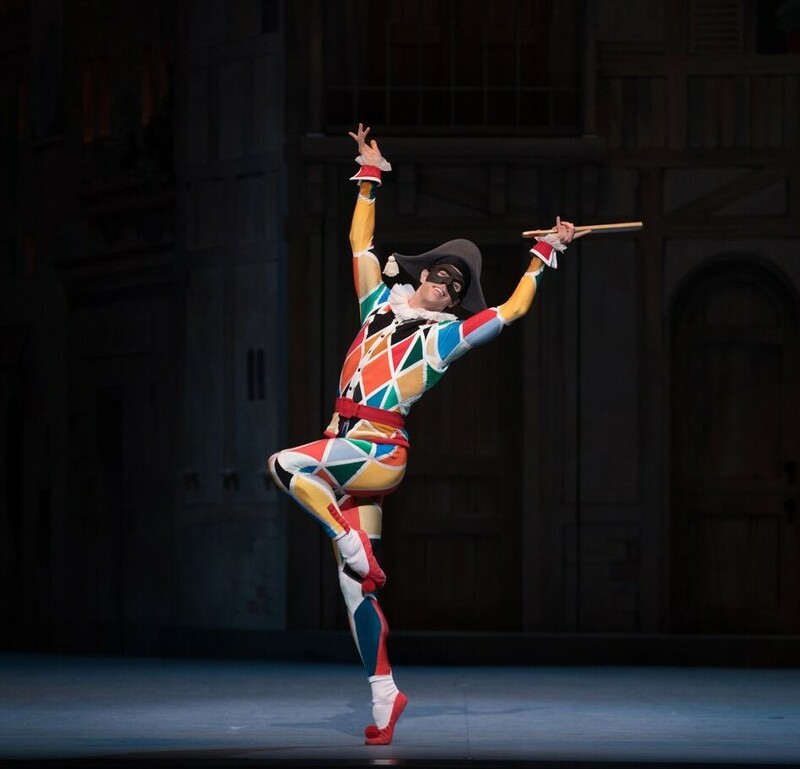 The plot of Petipa’s ballet is as simple as it is classic – Harlequin (dressed in his signature colorful tights with festive mask) loves Columbine, and it’s clear the girl loves him back. There is a decrepit old father, however, who wants her to marry an even more decrepit old rich man, turning loose his white-suited, floppy-sleeved servant Pierrot to catch the young lovers together and block their romance. Lots of genuinely funny physical things happen, accented by choreography that weaves in large swatches of over-the-top mime. But of course true love wins in the end. In classic commedia dell’arte, Harlequin wins by outsmarting and out-charming everyone – he is one of history original likable smartalecks, a primordial Groucho Marx. Yet when even he fails, there is his literal slap stick to drive off assassins, who don’t look like they really want to kill anybody, given to the hero by the Good Fairy. All lovers should be blessed with having a Good Fairy to call on, as needed. ABT principal dancers James Whiteside and Isabella Boylston, who created the lead roles when ABT debuted Ratmansky’s reconstruction in New York last August, illuminated the stage Tuesday evening in the first of seven company performances. Petipa knew his St. Petersburg audience exceedingly well by this point, so he augmented the comedy with more than one pass at a romantic pas de deux. With no dark side, nothing similar to Swan Lake is possible, as is nothing as timelessly and transcendently romantic as The Sleeping Beauty with only Riccardo Drigo’s score where the swelling Tchaikovsy might have been. Yet the two dancers evoke the physicality of young love as only a pas de deux can, courtly enough but also simmering with passion. Special attention is owed to Whiteside for his Harlequin. He manages to speak, especially in his solos, two dance languages in the same breath – skillfully blending the flowing prowess of classic male ballet with the fluttering stutter-steps, hand-claps while airborne and other symbols of comic joy that have attached themselves to Harlequin over the centuries. 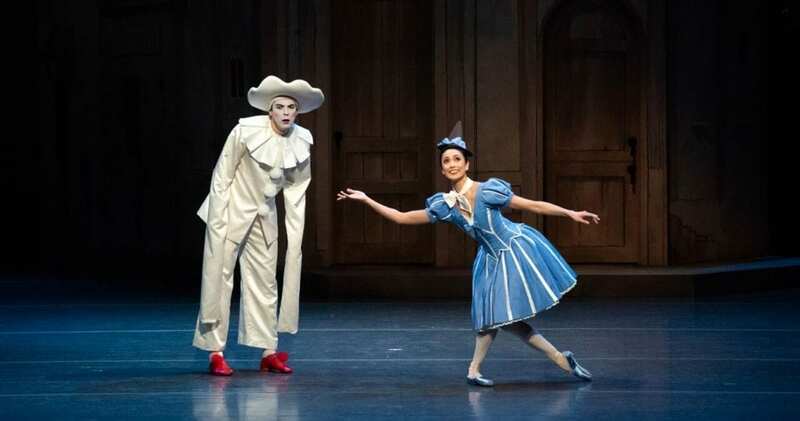 Thomas Forster delivers a serving of the wonderfully ridiculous as Pierrot, particularly the use of the figure’s forward slump beneath floppy white hat, wearing white face and eternally stuck with white sleeves that nearly brush the floor. The stage is set for a thousand and one physical jokes, most on a theme of “swinging but missing.” Stella Abrera serves as a lovely comic counterpart to Columbine as the big clown’s wife Pierrette, and we enjoy every moment spent with Alexei Agoudine as Columbine’s exasperated father, Duncan Lyle as her elderly suitor and Tatiana Ratmanky as the oh-so-generous Good Fairy. There is a large cast surrounding the action, some from ABT in New York, but many small roles danced by promising DC ballet students, who acquitted themselves well and drew a larger-than-their-roles ovation at the end, no doubt from their parents. David LaMarche did a spirited job of racing through Drigo’s score with at least one eye on the dancing – and he seemed to be having a great time doing it.